How do your clients describe your brand to their friends and family? Are you something that meets their needs or are they in love with your company? You've got to build a brand that's bigger and more tangible than your product in order to be discussed off-line. Old Spice doesn't just manufacture deodorant, they produce some of the most humorous marketing materials around. Nordstrom doesn't just provide a high-end retail experience, they're customer service professionals. How can you become bigger and better than your products and services? With a casual photo and personal anecdote about an experience that lead founder Leah Busque to start the project, it lends a personalized, small-business feel to the larger company. Did you know the technical meaning of the term jargon is strange, unintelligible or useless language? Describing your business in too much business talk can hurt your customers ability to relate to your business. Think about it as meeting them at their level. Use your buyer personas to develop an idea of what language your clients are going to react best to and explain your products and services in those words, not the latest buzzwords from your industry. This idea is pretty controversial, but your closed social media policy could be costing your company some fabulous PR. Why not put a face on your company and humanize your brand by allowing your employees to Tweet and post about your latest developments, if they wish? While the idea of not monitoring your employees' social media usage makes some companies panic, Fortune 100 Company IBM has thrived with an open social media policy. If your employees are saying great things about your company, it will let potential recruits and clients know that you're a great place to work. Besides, depending on the size of their networks, it can really expand the reach of your content. If they want to start taking designated social media breaks, it might help more than hurt. 56% of employees in a recent survey stated they just weren't willing to accept a position that made social media off-limits on the clock. Have you made a pretty serious mistake lately, especially one that may have affected a few of your clients? Don't try to sweep it under the rug. One of my favorite pieces of marketing blog content is via Hubspot, titled Marketing Hall of Shame: Hubspot's Worst Marketing Mistakes Revisited. They took a few steps back and analyzed things they'd done that had flopped massively, like when someone accidentally published "Why You Should Kill Your Sales Team" to their website navigation menu! It's appealing and educational and can really lend a charismatic face to your company. Similarly, if you win awards, don't publish a slick press release to your company blog. We all get more than enough faceless journalism in the Newspaper. Talk about what it took for your company to get there and recognize the people behind the award. Consider sending emails under your name, the CEO's name or someone on sales or marketing's name. People want email from people - they don't want messages from corporations. Humanize as much as possible. Can you include a headshot next to the email signature? How about a job title? 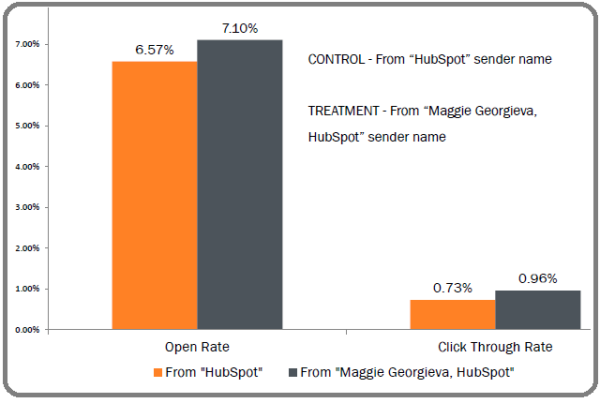 In the example below, via the Hubspot blog, signing emails with the real name of their Chief Content Officer Maggie Georgieva lead to a .63% increase in click-throughs! Putting a face behind your content marketing, email communications and company website might be just what it takes for your clients to start viewing your company as a group of hard-working people. People don't want to buy and rave about a corporation, they want human connections. If boosting your bottom line requires some wacky shots of your CEO on the company website, it might be well worth his embarassment.